Netflix recently released Iron Fist season 2 and, while you may have missed it, the new season contains a pretty blatant Fantastic Four Easter egg. Blatant as it may be once it's pointed out, the reference itself was reasonably subtle and not terribly heavy-handed, so nobody would blame you for not picking up on it. In any case, this is a pretty important reference that may come with certain implications. Warning: minor spoilers ahead for Iron Fist season 2. During the events of the new season's sixth episode, titled The Dragon Dies at Dawn, Danny Rand (Finn Jones) gets into a very bloody and violent altercation with his former buddy Davos (Sacha Dhawan). The two duke it out in a building that doesn't have anyone else in it, as it's under construction. Rand loses the fight and winds up beaten within inches of his life. Mary (Alice Eve) calls an ambulance to their location, which she proclaims to be "42 Baxter." There was a lot going on during that scene, but Marvel fans with a keen ear surely heard the name Baxter and had their ears perk up. And for very good reason. In the world of Marvel Comics, the top five floors of the Baxter Building, which is located in New York City, house the Fantastic Four. The building is located at 42nd and Madison. With 42 and Baxter crammed together in the episode of Iron Fist, it's hard to interpret this as anything but a direct reference to Sue Storm, Johnny Storm, Reed Richards and Ben Grimm, aka The Thing. The implication being that the Baxter Building, in this universe, is currently under construction, which opens up a world of possibilities. Disney, who already owns all of Marvel, is currently closing in on their purchase of Fox. That means the rights to the Fantastic Four, as well as the X-Men, will ultimately wind up back in the hands of Marvel Studios. While the connections between the Netflix shows are minimal, they do exist in the Marvel Cinematic Universe alongside the movies. That means this reference does carry some weight in the MCU. Does that mean the Fantastic Four will be making their way to New York City in the not-too-distant future? Is this the first seed being planted? 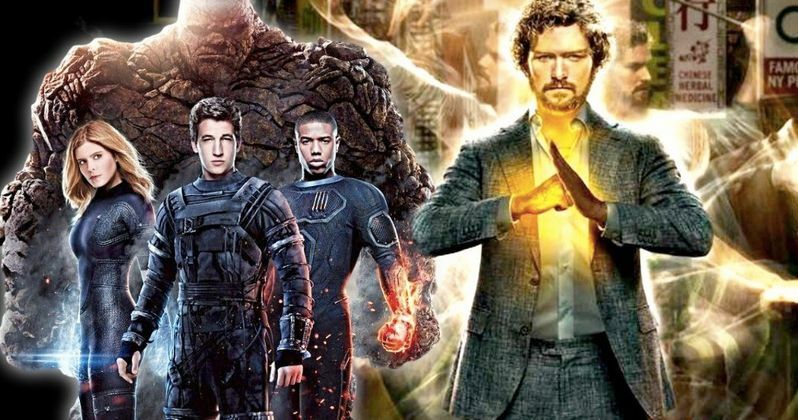 Maybe we're getting ahead of ourselves, but Kevin Feige and Co. certainly have plans for Reed and the gang once they get the rights back. Future Marvel shows are likely to be housed on the Disney Streaming Service. But that doesn't mean they can't also exist in the same universe as Iron Fist, Daredevil, Jessica Jones and Luke Cage. Perhaps we're reaching a bit, but what if this is the first seed that blossoms into an eventual Fantastic Four series announcement? The movies haven't really ever worked that well. Why not try bringing Marvel's first family to the small screen instead? Just a thought. At the very least, this is a cool Easter egg, even if nothing else comes of it. Iron Fist season 2 is streaming on Netflix now.